Cutter Loose is on the move again, headed north on the ICW. On Tuesday, the anchor is up in Beaufort in time to make the 9 AM opening of the Ladies Island swing bridge. Our next major destination is Charleston. Due to the tide schedule and slip availability at the Charleston Maritime Center, we decide to divide this 50 mile journey into two segments. 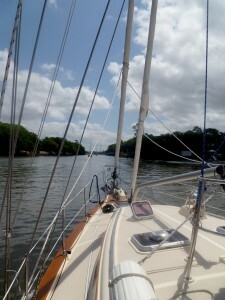 Tuesday’s leg takes us to a calm overnight anchorage at Church Creek. The ICW follows the Beaufort River and the Coosaw River to a dredged cut known as the Ashpoo – Coosaw Cutoff. At the narrow entrance to this cut, the tide has begun to rise with a vengeance. The VHF has been crackling with reports of shallow water at this intersection. Cutter Loose is swept sideways by the tidal current as she pokes her nose into this entrance, falling prey to the shallower water on the red side of the channel. The knotmeter reads zero and the depthsounder reads five feet…sure signs that Cutter Loose is aground in the channel. Thankfully, the bottom is sand and mud. Better yet, the tide is rising. With a little reverse thrust and aiming our stern towards the deeper water on the green side of the channel, Cutter Loose is floating free and on her way. From here, it is an uneventful trip along the South Edisto River and the North Edisto River to our anchorage in Church Creek. On Wednesday, the anchor is up in Church Creek at 9 AM. Our course takes us along the Stono River to its intersection with Elliott Cut, a narrow dredged channel near Charleston where tidal currents can reach 5 knots. A favorable current through the Cut pushes us towards the Wappoo Creek Bridge where we arrive well in advance of the noon opening. By 12:30 PM, Cutter Loose is anchored in Charleston at the intersection of Wappoo Creek and the Ashley River, a popular overnight stop for cruisers transiting the waterway. We will spend a few days in Charleston revisiting this attractive and interesting city.